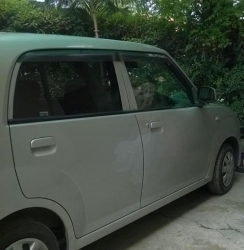 Excellent condition, single retired owner, silver colored low mileage (only 68,000 Km), factory fitted CNG, no accidents but minor dents, clean engine runs perfectly with years of trouble free life left. 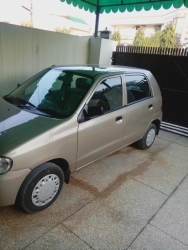 Asking price Rs 510,000.
first owner family used alloy rim, DVD player , AC cng, Life time token paid, Origional book Rawalpindi registered , origional inside but showered outside except roof, tires in v good condition. 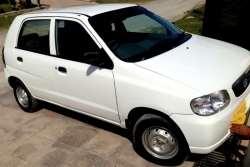 SUZUKI Alto vxr1000cc silver colour model 2006 Islamabad regd AC CNG, mechanically fit, interior-exterior good, alloy rim, good tyres, central locking, Original Registration book with open letter. demand 550000 Rs, contact A Ali 03455219920, under use of Air force officer. 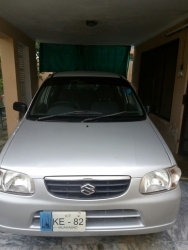 ALTO VXR 2007 silver in genuine condition...CNG/petrol both...everything is in working...no work required in car...price is a little negotiable...family used car. 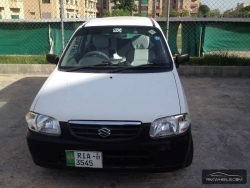 -Suzuki Alto VXR 2007, Petrol-CNG, AC, 1000cc -Lahore number. -Original book and file. -Lifetime token paid. -Genuine metallic blue color -No work required, ready to run condition. 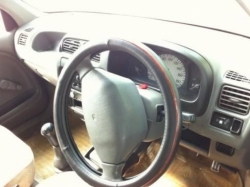 -Government officer maintained car in excellent condition, selling because going abroad. -Price is almost final, only serious buyers pls. 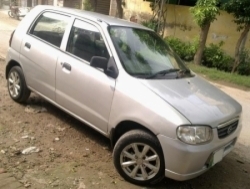 My Suzuki ALTO VXR 2010 model with company fitted CNG for sale. Bumper to bumper genuine, in excellent condition. 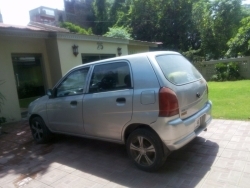 AC running perfectly, 59,900km mileage only, Islamabad Registered number, Graphite Grey color, Dunlop Tyres added, lady driven car and first owner. Real pics uploaded. Look and decide yourself. Only serious buyer should contact through contact number provided. 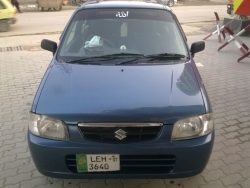 Car has 2005 model but its registry was done in 2007, so its not old according to its model Life time token, New interior seat covers, used for family only. Alloy rims new tiers , Untouched body no work on body ever. engine is in good condition. Very good mileage on each fuel. Just pick key and enjoy its drive. I don't used AC of this car to have good engine condition of my car. Alto VXR AC CNG All functions operative and best maintained. Fully maintained by Suzuki Motors as per Suzuki standard schedule. Family car, driven with extreme care. Life time token paid. All components in 100 % genuine condition. No dealers will be entertained. No Exchange required. Good Well Maintained Domestic used car. Alto VXR CNG and Petrol.Good condition.Never been on long routes. Good well maintained Car used by an Officer. Original Condition. NO Work Required.